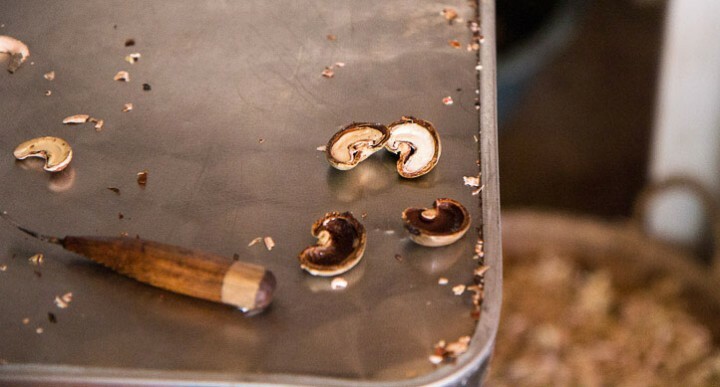 Now that you know exactly what cashew nuts look like and where they come from, let’s see what we can do with them. 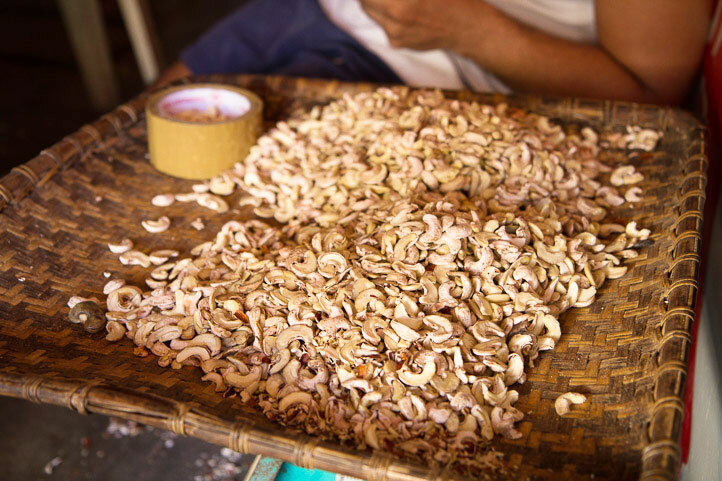 I went to a small, old-style processing factory in Coron Town, and there again, cashews nuts surprised me. Here is everything you need to know about cashew opening, a risky business. It’s a sort of shop open on a street, with a mess of tables and chairs, where you can have a glass of fresh buko juice. I’ve walked along that street a thousand times, and I would have never guessed that, every summer, this place was becoming a cashew processing facility. Yes, I saw that they sold cashew nuts, but I had no idea they were processed there. Today, ther’s no doubt about it. They’re opening cashew nuts, they’re doing nothing but that. Five people are getting busy in the small and messy space, each one having a particular task assigned. One of them has to open the shells. Three other ones extract the nuts. Finally, another person will have to remove the second shell from the extracted nuts. Here are the details and some pictures. First, a young man opens the nuts with a trimmer. One by one, the cashews are held with one hand under the blade. With the other hand, the young man pulls the blade down and cuts the nut in two. That’s why, if you buy cashews that were processed in a traditional way, you’ll never see whole nuts but only halves. Naturally, cashews, unlike walnuts or peanuts, don’t have two lobes but are one single nut, like an almond. It’s the way they’re opened that makes them two halves, changing their original shape. The opening takes forever as the nuts are all done one by one. And as alienating as it may be, you have to stay vigilant because the tiny nut must be held with the fingers as the sharp blade cuts it in two. Once all the cashews are open, we can move on to the second phase of the process. Each nut half is still trapped in its shell and has to be released. And it doesn’t come that easy. So the workers use a special tool, a small gouge with a slightly curved iron end. 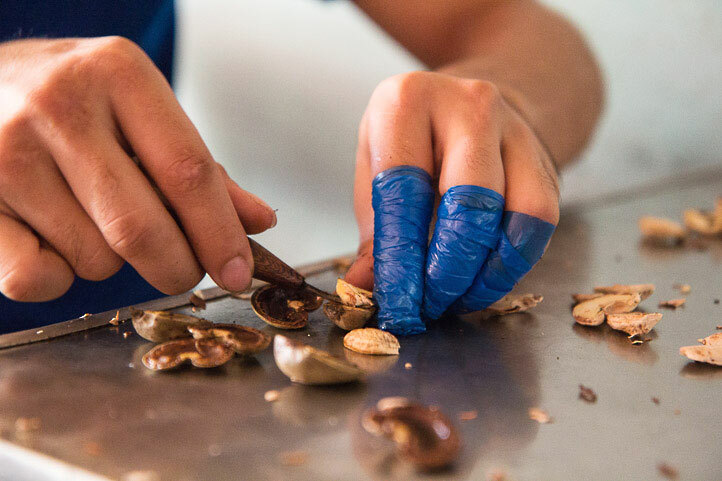 With one hand, they hold the nut half, and with the other hand, they use the gouge to get between the shell and the nut, pressing and rotating the tool at the same time. They have to be very careful not to damage the precious nuts. During this step of the process and the previous, they might get some of the cashew acid on their hands. So they protect their fingers in a simple but efficient way. The index, middle finger and ring finger of their left hands (the one that holds the nut) are wrapped into bits of plastic bags, as it is the only matter that acid cannot burn. So their bandaged fingers are not a Michael Jackson fetish, it’s the only way for them to avoid acid burns that could seriously damage their hands. Once this operation is complete, the nut halves are still covered with a thin second shell that’s sticking to the nut. Its colour is close to the cashew’s, it’s thiner than a sheet of paper but it’s a bit hard and not very nice to eat so it has to be removed. So it’s time for a second extraction, which is the third phase of the process. An old man is doing it. 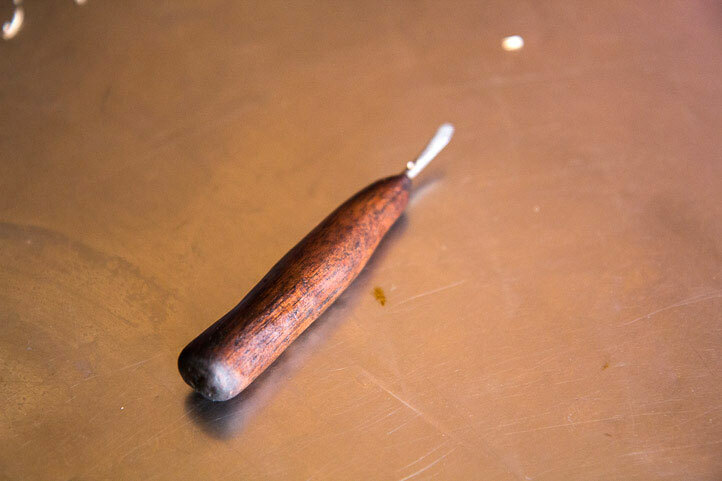 With a gouge or simply with his fingers, he removes this pellicule that tends to crack. After all this work, the cashews are clean and ready to use. Well, almost. They will need to dry for one week. Then they’ll be able to be fried, roasted or cooked in brittle. To process 26 kilos of cashew nuts, the five openers will work full time for one week. Add one week to that for the cashews to dry, then add the time to cook them, and you will know why cashews are so expensive. They take time, an awful amount of time. For those 26 kilos, they payed 30 pesos a kilo (50 euro cents). They bought them to some villagers who had picked them. 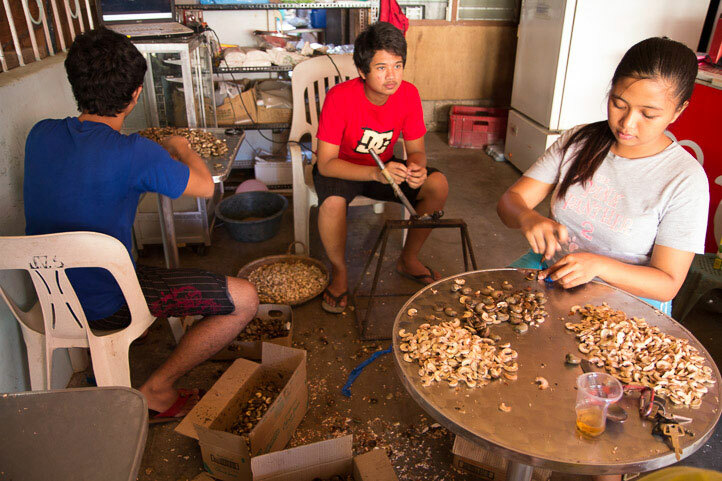 After the complete processing – opened, extracted twice, dried, fried, salted and conditionned in bags – the cashew openers sell them for 600 pesos a kilo, so 20 times more than the price they bought them. They blush and tell me: “It’s so expensive because it takes a lot of work…” 600 pesos is a lot here, it’s about 10 euros. In France, the lowest quality cashews you’ll find will cost you around 10 euros a kilo. The best ones will be around 25 euros a kilo. Most of them are industrially processed. I have to say the nuts prepared in Coron are particularly good. The product itself is excellent. it’s grown without pesticides, fertilizer or anything else. Then it’s processed without any chemical products and without using big machines that could have an impact on the taste or the texture of the final product. 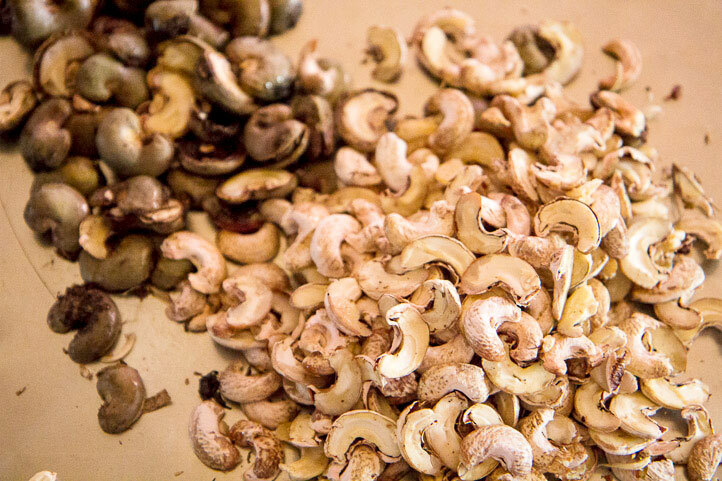 What’s more, Filipino cashews (kasoy as we say here) are quite big, and that’s even better. I was googling cashew nut production in the Philippines and it took me here. It’s a great read you have here. Pretty cool passion you have. Btw, i’m an engineering student from Manila and it’s my undergraduate project to make a cashew deshelling machine. Just wanna ask the you Ms. Cam if you’ve seen a machine that do that shelling work in Palawan? Thanks! Thank you very much, glad you liked it! I haven’t seen any machine of that kind in the Philippines so far. It might exist in Puerto Princesa, in big factories, but I’m not even sure. 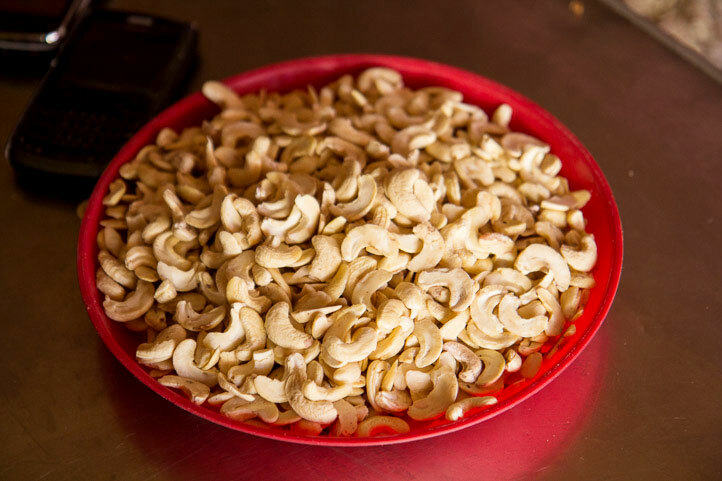 You should be able to find ideas if you look at Indian websites, they’re the kings in terms of cashew processing! Thank you, Cam! Indian indeed has tons of information about it! Btw, you should ‘isaw’! It’s one of the favorite street foods in the country. I find myself stuck reading your articles. Keep it up! Sayang. But i just saw your French articles on Pinoy food. Google translate is not that bad. Awesome article! I didn’t know the process is this tedious! Explains the hefty price tag!